Which Cars Pass the LTFRB's "Strict" Standards for Taxis and TNVSes? The Land Transportation and Franchising and Regulatory Board or LTFRB just threw the rule book at the Transport Network Companies (Uber and Grab to you and me). In a recent press conference, the government agency responsible for land-based public conveyance is reminding both Uber and Grab that they have to phase out non-compliant TNVses in 90 days. With the Memorandum Circular published last December 2, 2017, that sets a March 2, 2018 deadline. The LTFRB’s requirements seem simple: phase out hatchbacks with a displacement of less than 1.2-liters. But digging deeper, it’s not as simple as that. 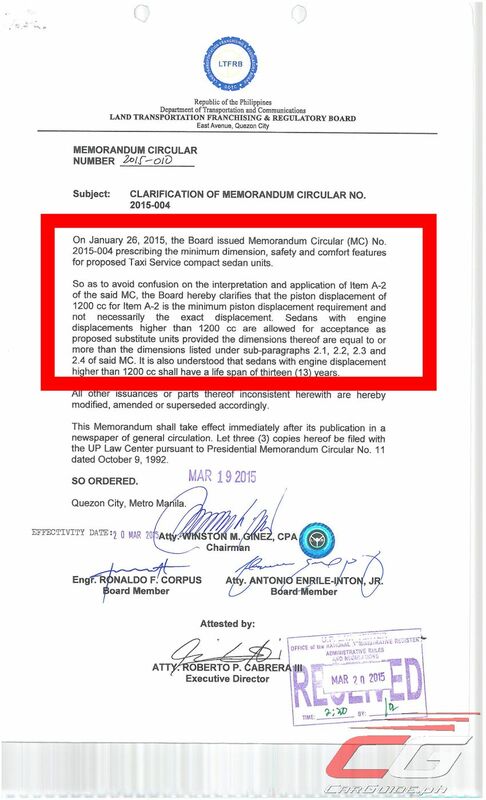 The Memorandum Circular that the almighty LTFRB is citing (MC # 2015-004) covers the country’s minimum standards for authorized taxi units. It so happens that the LTFRB told the TNCs to adopt the same standards on all TNVSes for the sake of public comfort, safety, blah, blah, blah. Looking at these standards, we just had to check which vehicles pass the LTFRB requirements. You can check the full table down below, but you’ll be surprised that the list is short. 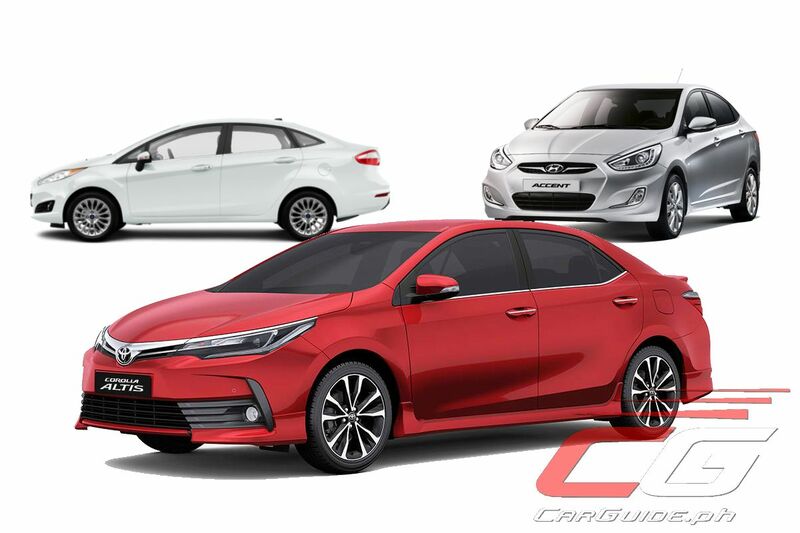 Considering that the vehicles we chose are those that sport both sedan and hatchback body styles (the LTFRB is allowing hatchbacks for now) and with a price tag of P 1,200,000 and below. Not much Hyundais on the list? They don’t pass the minimum requirement for airbags. Ditto the Mitsubishi Adventure and Isuzu Crosswind. No Ford Fiesta? Only the 4-door 1.5-liter sedan due to either displacement (EcoBoost) or length rules. Honda Civic, Mazda3, Volkswagen Jetta? Too low. The best part? This is just a partial list of standards. The LTFRB also cites that the rear legroom (the distance from the cushion of the rear seat to the cushion of the front seatback) must be 650 millimeters with the front seat fully retracted backward. They also want the luggage space to measure at least 310 liters. We don’t have the available data to further weed out the vehicles that passed the first round of scrutiny, but it’s not hard to imagine that one or two of them will be ineligible. In other words, imagine what will happen if the LTFRB wakes up tomorrow and says that they’ll implement these standards to the letter. Just imagine just how many taxis and TNVSes will be taken off the streets and just how many commuters will be left stranded. Idiots, these cars passed international standards, save for a few. Displacement is not a good measurement for overall vehicle performance. A better metric would be power to weight ratio since there there are different types of vehicle you can avail such as UberX or UberXL. Basis for safety should be based on standardized Euro NCAP or ASEAN NCAP ratings. Only allow 4 stars and above for example. The only thing they got right is the legroom and luggage space of having at least 310 liters. They should include mileage in the metric as well to please environmentalists lol. I doubt if Honda will allow its vehicles to be used as TNVs. I spoke to a Honda Dealer. They're good with it being used as TNVS, but not as Taxis. Basta talaga nasa gobyerno, tanga. Kaya nga nasa gobyerno yang mga yan eh... di kasi pumasa sa job interview sa private sector. Presidente pa lang, 7 years sa high school... lmao... tanga talaga. To the author, please read LTFRB MC 2015-010. It clarifies the minimum dimension, safety and comfort features. Yup. It just clarifies the part about engine displacement. "the piston displacement of 1200cc for Item A-2 is the minimum displacement requirement not necessarily the exact displacement." "Sedans with engine displacements higher than 1200 cc are allowed for acceptance as proposed substitute units provided the dimensions thereof are equal to or more than the dimensions listed under sub-paragraphs 2.1, 2.2, 2.3 aand 2.4 of said MC." Thank you for pointing that out. 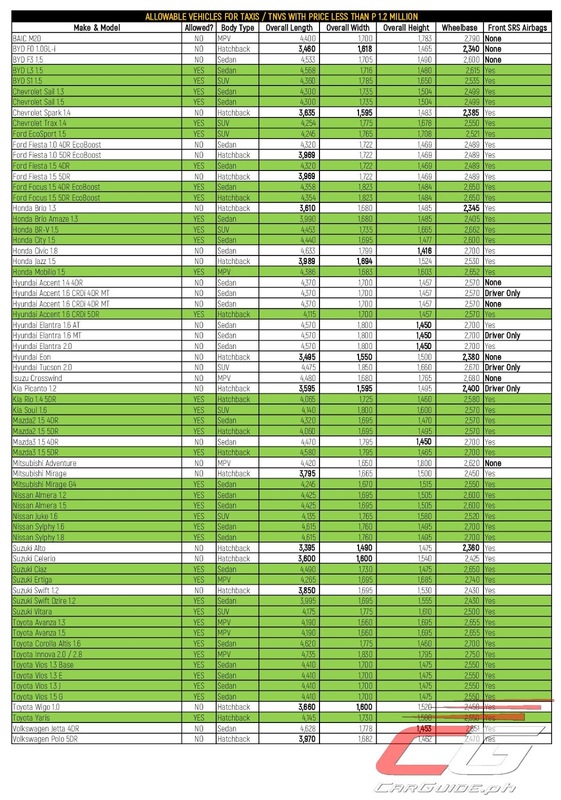 Made corrections to the table and the article as well. Our apologies for missing out on this. 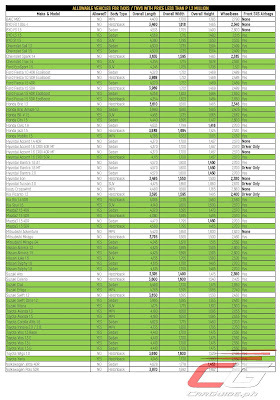 By the way, minor error, please change to "YES" for Honda Brio Amaze 1.3 (already colored green). This one barely met the target. Too bad for his brother, Honda Jazz 1.5, for being short by just 1 mm (roughly the thickness of a five-centavo coin). Volkswagen Jetta 4DR did not meet the height requirement:only 1,453 mm versus the required 1,455 mm. Please change to "NO". Mitsubishi Expander and Toyota Rush are new models, are they now allowed? Before posting correction to your article. Acknowledge mistakes and correct them promptly and prominently. Explain corrections and clarifications carefully and clearly. This is your responsibility. Many people blame ltfrb for your wrong info. We have posted the corrections less than an hour after it was pointed out. At least we take the time to acknowledge and correct our stories. Some actually don’t. We value the response that our readers give us and we do take these things seriously. As for blaming the LTFRB, we are blaming no one in this matter. It’s more like an eye opener that our laws are crazy complicated (new circulars constantly contradicting old ones) and that the enforcement of the law is selective. Isuzu Crosswind and Mitsubishi Adventure can also be used as Taxis and GrabCar 6-seater. Chevrolet Spin can also be used as GrabCar 6-seater but not TNVS. Peugeot 301 may also be used as a TNVS car but not as Taxi. Coming Soon to the Philippines: Toyota Hiace Commuter, Toyota Hiace GL Grandia/Super Grandia/LXV Hyundai Grand Starex Super Express, Isuzu i-VAN, Mitsubishi L300 XV Mikrobus, Foton View Transvan, Foton View Traveller, Mitsubishi Fuso Canter Tourista, and Nissan NV350 Urvan Shuttle/Escapade/Premium as GrabXL & Grab Shuttle. when it's going to start the grab Shuttle and XL? as for the airbags, ano pong MC binanggit yung about dun? If you look at the minimum standards set by the LTFRB, all taxis and TNVSes should have dual airbags. Ang Adventure walang airbag. Pwede na gawing Regular Taxi ung Mazda 2, Mazda 3 Ford Fiesta and Ford Focus! Now meron naman palang ganyang standards, why don't we expand the safety requirements to cover ALL cars sold here in our country? O baka meron na, wala lang nageenforce? Dura Lex, Screw Lex. Mabuhay ang Pilipinas. which uv express vehicle have airbags? if safety is the main concern due to no airbags, then all uv express vehicles should not be allowed as public transpo. Correct!!!!! so meaning mitsubishi adventure is not allowed so dapat tangalin din ang uv express and let the people suffer. Oo edi dapat lahat ng UV express na adventirevat crosswind ipag vawal nila.,ang daming nag labas last year na brand new pang UV. Pano gagawin nila dyan? I would like to say that this bill doesn't interest me, but it isn't so. I had expected the Japanese marques Honda Civic and Toyota Yaris won't fall under this change, but I was wrong on the account of Toyota. Then among the used cars that suit me, remains only Honda Civic and this decision is connected not only with the appearance of changes in the LTFRB but also by the change in the interest rate on the loan. So I'm gonna get a report https://www.faxvin.com/ and choose quite good Japanese car. Talking about tnvses and taxis that did not pass the standard of LTFRB, the question will go back to our government that why is it they allow selling said vehicles in the Phils, and it passed also to the safety standard be it for public and private riding safety..And it passed also to the International standard ..In addition, an daming UV express and taxis na walang airbags din, pero bumabyahe dn.. Ano ba talaga kau sa ltfrb? 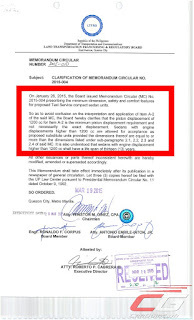 Ang dali nio lg magsabi na tanggalin pero ang hirap sa side ng mga car owners na umutang ng sasakyan tapos ang investment mawala na lg bigla kapag for implementation na ang MC stating the lists of cars na wla sa standard for the riding public..hoping for the immediate resolution of this concern.. If we are talking about the "law" in regards to safety standards, The only thing i can say is that why allow tricycles, jeepneys with no seatbelts or buses with broken air brakes or even uv express with no safety standards funny how that works. There are no proper laws here it's just whatever the government wants since uber and grab are in the private sector they can only charge them a small amount. It boils down to effin money. which of the JAC vehicles can we use for TNVS? is the JAC s1 allowed? Ang Hyundai accent ba HND na pwede SA grab? how to convert private car to taxi? How about the new comer mitsubishi xpander can pass? Madami pla na substandard na sasakyan. Dapat Hindi pinayagan Ng LTFRB na mag benta Ng ganyan dito in the first place. Bulok talaga utak. Yung PUJ nga Wala airbag kahit seatbelt substandard or Wala pa Yung iba at overloading pa most of the time. Tapos dito mag iinarte Ang LTFRB... Wag nmn Sana magpahalatang tanga. Sobrang Obvious. pwede po ba ang nissan urban 2014 sa grabxl? Kung hindi na pwede ang Hatchback, papasa na ba ang Sedan ng Hyundai Accent? Hi. Is the new suzuki swift accepted to apply for TNV? Pwede po ba ang mitsubishi montero? Pwede po ba ang mit montero? Pwede po ba ang Honda Jazz RS navi ? Pwede kaya sa grab ang hyundai elantra 2013? Balak ko kasi ipang grab un elantra ko. Hyundai Accent hatchback 2017 model pwede? Is Mitsubishi xpander allowed to be a grabcar? So When Are Car and Gas Prices Going Up?